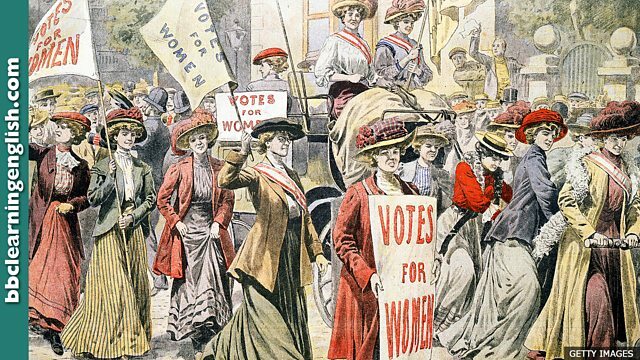 It's 100 years to the day that women in the UK got the vote. Rob and Dan teach you the language the world's media is using to discuss this story. It is 100 years today that The Representation of the People Act was passed. This gave women in the UK the right to vote - provided they were over 30 and owned property. The Representation of the People Act was introduced in 1918 following pressure from the ‘Suffragette’ movement, which campaigned for the right for women in the UK to vote. The suffix ‘-ette’ comes from French. But what does it mean? Today marks 100 years since The Representation of the People Act was passed, giving women the right to vote. The change in law affected women over the age of 30 who met certain property qualifications, but full electoral equality didn’t follow for another decade. The fairy tales that we know and love today are only ______ versions of the originals. They were much darker and more adult. The prime minister issued an official complaint against the newspaper for publishing an offensive ______ of him. Even though he had probably saved many people, the man was not ______ since he had committed murder to do it.